Well, I had been warned it was gonna happen but didn´t really expect it to pan out the way it did. On the tour from the Puerto Iguazu to the Argentinian side of the falls we had been given a packed lunch of a bap and an apple. Bout three hours into walking around the park, we reached a restaurant. As we approached we could see a group of people standing about oohing and aahing...there was a coati there. It started coming towards our group and we were backing off, I had been holding my plastic bag with my sandwich in it in my hand and it must have heard the rustling cos it made a beeline towards me and started jumping at me. It was about this time that it began to look viscous rather than cute as I could see it´s claws. Did I mention that it is big enough, not quite the size of my dog but close. Oh, and I never got a rabies shot before going because sure when would I be near any wild animals? I had backed into a fence by now and then it jumped and tore open my bag, took the sandwich but left me the apple with claw marks in it. There are signs all over the place saying do not feed the animals but it´s not like I had much of an option! 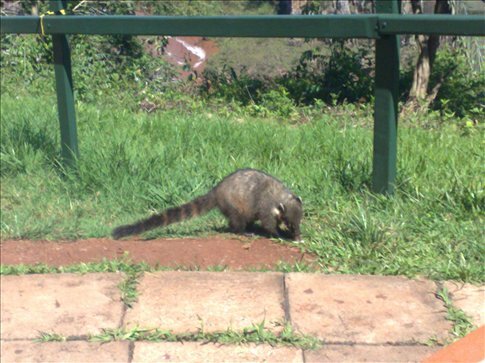 Turned out that the rest of the group thought that their sandwiches were horrible so the coati did me a favour! Ha...i tink dats the funniest story eva!